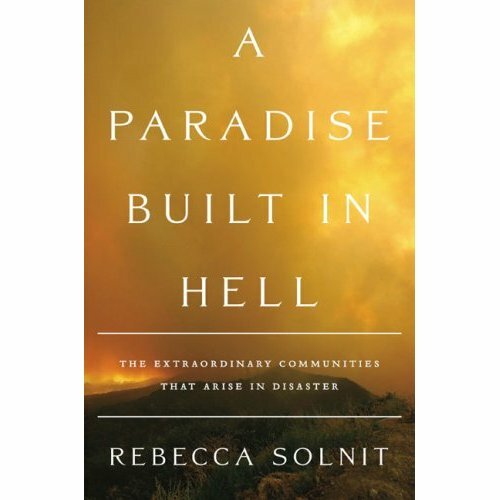 If you, like me, have come to dread the anniversary of 9/11, with all its attendant angst, Rebecca Solnit’s new book, “A Paradise Built in Hell: The Extraordinary Communities That Arise in Disaster” could provide some solace and/or diversion. I’ve not read it, only read Dwight Garner’s review in the New York Times and Steven Winn’s in the San Francisco Chronicle, but I wholeheartedly agree with Solnit’s premise, that most people respond heroically in emergencies large and small and, in fact, derive satisfaction from their generous actions. In workplace situations that don’t count as disasters, such as when a valued colleague leaves and everyone pitches in to get the work done, I have seen this kind of “social capital” at work, people immersing themselves in service, pitching in to get the work done, and feeling good about their efforts. Solit calls it “paradise” when a community pulls together to pursue a survival goal and achieves a sort of euphoria. And I’d like to think that I, as an individual, could achieve the same high if I could manage to pull myself together – and somehow, once and for all, organize my time — to reach a goal. For specific suggestions on how to “reset” your life , consider listening to the motivational speaker Bill Boggs, scheduled for the Princeton Chamber lunch on Thursday, September 10, at 11:30 a.m. at the Forrestal Marriott. The four-time Emmy winner will share success strategies from his recent book, “Got What It Takes? Successful People Reveal How They Made it to the Top.” Call 609-924-1776 or www.princetonchamber.org.